Beal has an academic background in women’s and gender studies. They received their bachelor’s degree from the University of Texas, Austin and master’s from Brandeis University. “The idea of taking the theory that I spent so many years learning and putting it into praxis in a real way is exciting,” Beal said. However, Beal said that their background in community organizing will also impact the work that they plan to do as director. Beal did community work since they were a young adult, but their time at the University of Texas, Austin cultivated their passion for activism. They worked in campaigns that organized against hate crimes, trans-exclusionary employment practices and anti-abortion groups. Welcome to the WGC website! My name is Jesse Beal and I am the Director of the Women's and Gender Center. I joined Amherst in March 2016. 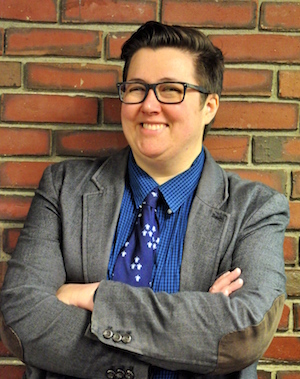 Before coming to Amherst, I served as the Acting Director of The Office of Diversity Services at Suffolk Univeristy and as the Program Coordinator for Sexuality and Gender Diversity at Brandeis University. I have been an activist and education on Trans and Queer identities, feminism, and social justice for over a decade. I hold a Master of Arts in Women's and Gender Studies from Brandeis University and a Bachelor of Arts in Women's and Gender Studies and Government from UT Austin. I'm passionate about creating spaces for challenging conversations around gender and intersectional feminism. My pronouns are they/them/theirs.